The UIC Graduate Employees Organization (GEO) needs your help and solidarity! 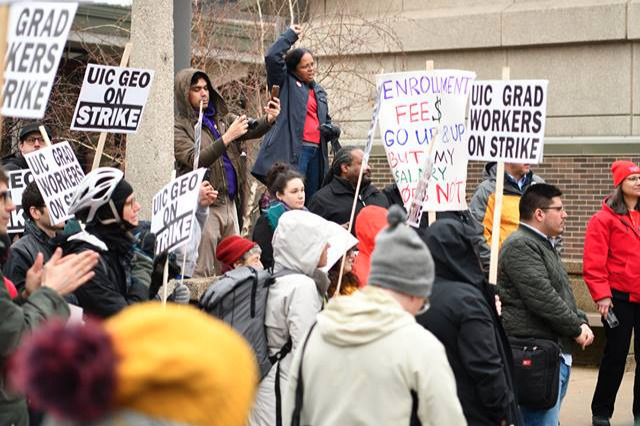 Over 1500 Teaching Assistants and Graduate Assistants at the University of Illinois at Chicago have been working without a contract for over 5 months, and GEO has been in negotiations with the university administration for over 1 year. Grad workers at UIC live in a state of constant financial anxiety, often not knowing whether we will continue to have a job appointment each semester, and making as little as $18,000 while simultaneously having to pay $2,000 in university fees, even when serving as the lead instructor for classes of up to 60 undergraduate students. On March 19, we will begin an indefinite strike to win a fair contract! We're asking for donations to our strike fund to ensure we can hold out against the university administration for however long it takes to win living wages, fee waivers, and transparent appointment policies.